Dye plants work on their own time tables, ignoring (my) schedule, day job hours and other relivant interruptions which may be why I prefer using dry-ables. The Fennel seems to be going into its die-off cycle. Fortunately its one of those dye plants that seems to work just as well fresh or dried and I have enough stocked up for what passes as Winter in California. And, about the time that the Fennel is finished the Oxalis will probably be reappearing. It would probably sound great to say I grow all my own dye plants but I certainly don’t – lack of space for starters. I probably have sufficient garden space to grow dye to cover sock toes. 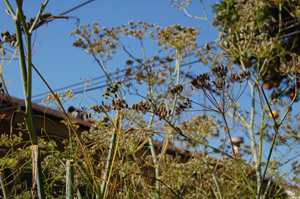 The Fennel (yellow dye), until I transplanted it into the yard, I used to chase around town ahead of the weed abatement people. The Oxalis (the other yellow) appeared on its own and refused to leave. Since both of these work well fresh or dry I can save and dry for the season and have enough to dye beyond the sock toes. Otherwise I rely on things that are going to be tossed out – Onion peels, lawn grass and Eucalyptus leaves for example. I have grown Maddar but again its hard to grow enough for an extensive dye project so I buy that dried. I have to Woad plants going this year but again that probably toe coverage so the Woad and Indigo are also purchased dry. 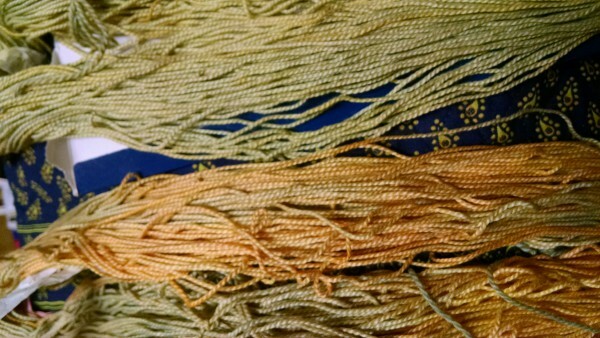 My little overdye experiment – the Knitpicks sock blank – has some Oxalis (yard), Maddar and Indigo. This is also my first time knitting toe-up, two-at-once socks. 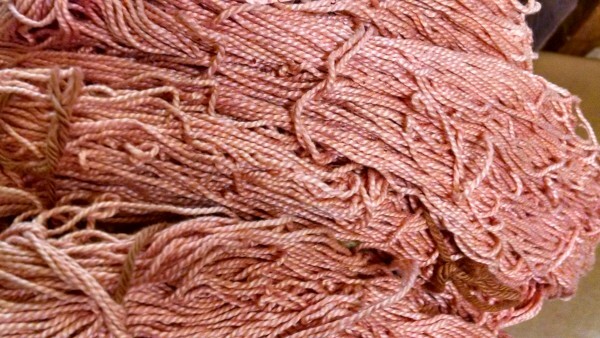 Lastly, this is the new wordpress version of the dye blog. 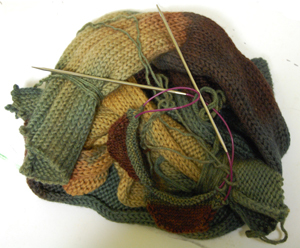 After following the Knitpicks sock blank knit-alongs and dye-alongs I decided to try one myself using dye plants. Knitpicks sock blank. Starting with an overnight soak and standard Alum bath. Start with Oxylas. The sock blank soaked up the dye incredibly well. I underestimated the wicking effect and lost the white spots. For the next one it mgiht be interesting to try with some dry areas. Some ‘saddening’ with Iron and Copper to tone down the yellow. I am a total convert to the Magic Loop method of sock knitting but have never tried two at once or toe up. The pattern is good but I was somewhat confused at the beginning. Once over that hurddle I think the rest will be fairly straight forward.